Living in a grass thatched wattle house, 46 years Nelima Betty (Pseudo name), narrates how her life has changed after going through difficult time since the death of her husband, the only provider to the family. A resident of Mpugwe trading center, Masaka district in Central Uganda, Betty is living with HIV and has two children with one of them HIV positive as well. Her husband died and left them stranded. “I could not believe that life would change for the better after what we went through since the death of my husband. We lacked food and were always tormented by our village mates. I knew my child living with HIV was going to die. I had lost hope,” narrates Betty. In 2013, Herman, a Coordinator for Nkobazambogo Youth Group, supported by Mildmay Uganda passed by Betty’s home and encouraged her to join the group. He enrolled her into the group. Since then, Betty’s life and her children has tremendously changed. “Joining Nkobazambogo youth group with my two children, was a turning point. I was given two piglets (female & male) to start my project,” she adds. 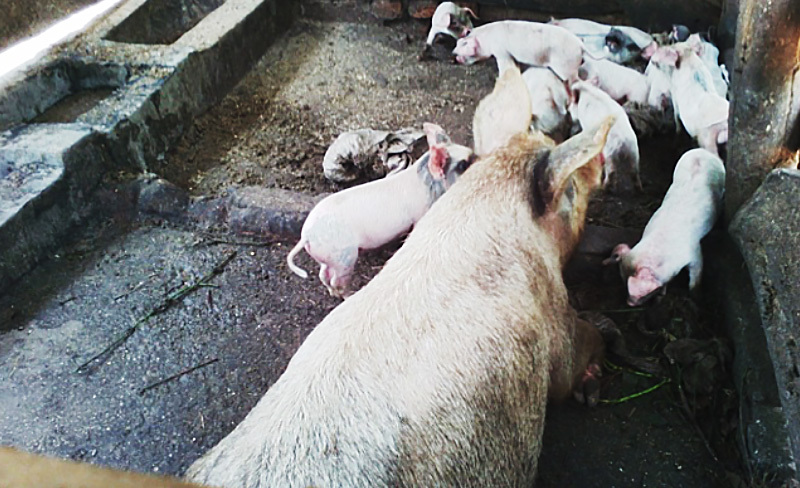 After selling 10 piglets, Betty was able to install piped water at home. “It saved me from buying water from those who vend it on bicycles where by a 20 liter jerry can is at 500/= and also offered me an opportunity to have water for my piggery project. In addition, I sold off two pigs and installed electricity in the house. We are now a happy model family in our community,” she explains. After saving money from the selling piglets, Betty expanded her farm with two cows that have offered her increased income from the sale of milk. “Am no longer worried of paying school fees for my children. I can now cater for school requirements for my children and also some basic requirements at home. Before I acquired the cows, my children were studying in Universal Primary Education (UPE) schools with basic or poor standards, but now they are no longer in UPE schools and I am able to get all the school requirements. My first born is now in senior four and the second one is in P7,” Betty happily explains. With financial support from PEPFAR through the U.S. Centers for Disease Control and Prevention (CDC), Mildmay Uganda OVC program, empowers marginalized communities more especially households that are headed by HIV infected and affected carers. They are equipped with Knowledge and skills of Economic empowerment so as to improve household livelihoods. Betty has since been counseled on adherence, treatment and disclosure to essential stakeholders more especially the school authorities. “The counseling sessions have helped us to live a happy positive life. There are many people living with HIV. For me I am very strong and confident; in fact I pity those who continue to hide themselves, what I tell them is that when you hide, there is a lot you are losing. Because, I always show them my son as an example, because the way he appears you cannot even suspect him to be on treatment,” she explains. The OVC program has empowered Betty that now she is confident of her future and her children. “Am not worried of anything now. My son is completing senior four. I feel my project can continue regardless of anything. I sold off some mature pigs and I bought another plot of land at 2M where I do more cultivation,” reveals Betty. In addition, Betty is also saving with a Voluntary Saving and Loans Association (VSLA) in her community. Through working with community based organizations (CBO’s) to reach OVCs, in 2014, Mildmay Uganda rolled out the self-monitoring group model by training champions from CBOs that assessed and recruited households into organized groups. The groups have implemented different projects including VSLAs and farming schemes that have since empowered households economically. The program has improved lives to over 1,119 households from vulnerability. They have received suckers, maize seeds, beans for planting in their gardens with the aim of improving OVC household economic status, multiplying the seedlings, food security and improve nutritional status of the home. They also received vegetable seedlings for the backyard gardens mainly greens to as well cut on the costs for buying vegetables. According to Uganda’s Poverty Status Report 2014 by UNDP, poverty in the country is on a downward spiral; however, the largest percentage of households still remains in abject poverty. The OVC program is a safety valve for many household in the rural communities. The Mildmay Uganda OVC project in the district has seen many OVC households enrolled on the project and supported to improve their livelihood. Through working with Community Based Organizations to reach OVCs, Mildmay Uganda rolled out the economic strengthening model to mitigate economic shock for the most vulnerable households that could potentially affect uptake or retention in HIV care. HIV and AIDS is known to further exacerbate pre-existing economic vulnerability by interrupting income streams, depleting assets, introducing labor constraints, and increasing dependency ratios. In addition, poverty limits the uptake and impact of HIV and AIDS prevention and treatment services. Mildmay Uganda trained champions from CBOs that assessed and recruited households into organized groups. The groups have implemented different projects including VSLAs and farming schemes that have since empowered households economically. Betty is confident that her future and the entire family is bright. “Five years from now, our lives will continue to improve, for example you see my house, it is not yet completed, but you will come back and find it completed. But I first want to push my children higher in school,” she explained.